Get your best skin back with Gallinée's patented complex of prebiotics, probiotics and lactic acid. Gallinée is the first brand to take care of the skin's protective ecosystem - the microbiome - using an innovative patented prebiotic, probiotic and lactic acid complex based on the latest research in microbiology. 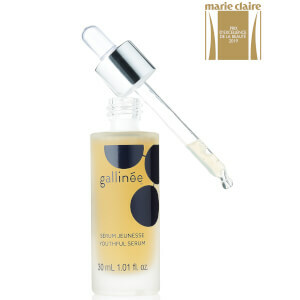 Gallinée's gentle formulations nourish and support the skin's good bacteria, whilst fighting off the bad ones. Create a brighter, softer, healthier looking complexion by ensuring your skin's microbiome is protected and strengthened. Toner but so much better. The new Face Vinegar creates the perfect step between cleansing and caring for the complexion. A toner that is purifying, soothing and reparative. Pores look smaller and skin brighter. A radiant glow from head to toe. Soap-free and oh-so-gentle. Cleanse, soothe and nourish your skin with our patented complex of prebiotics and lactic acid. Gentle enough for face and body, the Gallinée Cleansing Bar is formulated at pH 5.8, respecting your skin's natural pH levels. Cleanses, softens and brightens. Perfect for all skin types, even the most sensitive ones. Help support your skin's good bacteria. Youth is something to cultivate. Our serum is highly concentrated in innovative probiotic, prebiotic and postbiotic actives. Cleanses, brightens and refines. Get the twin action of a mask and a scrub; gently exfoliating the skin, leaving it clearer and brighter. Marie is a French Doctor in Pharmacy with 15 years experience working for innovative skincare brands. After discovering how a prebiotic and probiotic diet could improve her symptoms of gluten intolerance, Marie had a Eureka moment: What if we applied the same science to skin? She wrote a thesis on the benefits of harnessing good bacteria and then she created Gallinée.